In 1619 Johannes Kepler published Harmonices Mundi (The Harmony of the World). The book contains his definitive theory of the cosmos, blending a refined version of his original polyhedral theory with elliptic planetary orbits and the theory of musical harmony. Thanks to his harmonic law—nowadays the third law of planetary motion—he succeeded in fulfilling the ancient dream of proving that the heavens resound (silently) to the same chord and scale structures as Western music. 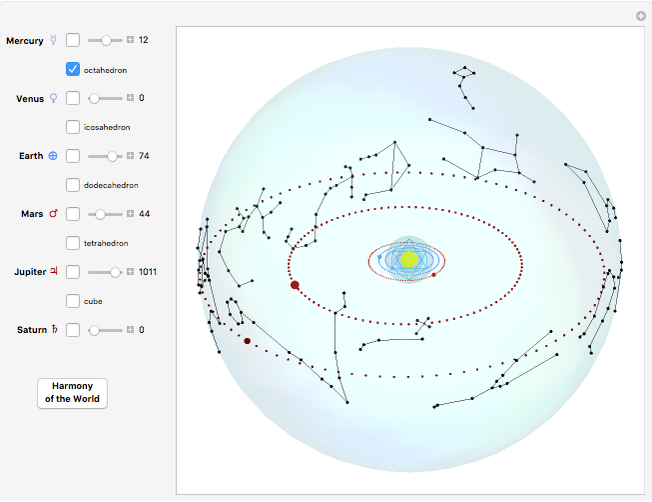 This Demonstration allows you to view and hear Kepler's universe. Tune the cosmos by placing the planets in the desired constellations by means of the sliders next to their names, or simply start from the great planetary alignment in Pisces, and click the "Harmony of the World" button to play and pause the music. 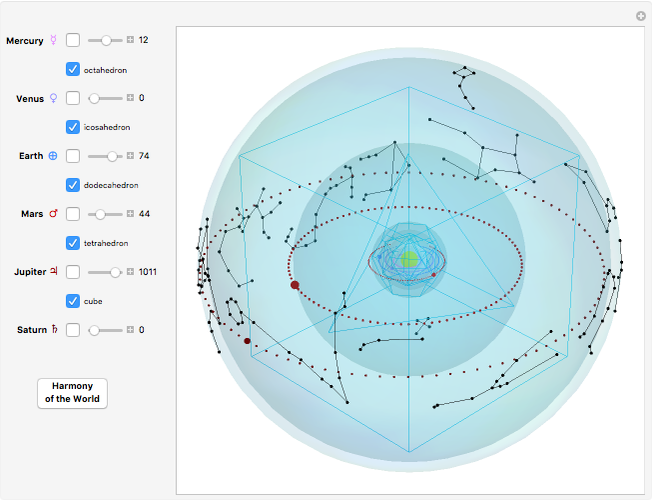 By clicking the checkbox next to the planet names, you can include or exclude the tune of every single planet and display or hide the regular polyhedra and planetary spheres. The variation of a semitone in the tune of Mercury, a clink of the harpsichord, corresponds roughly to four terrestrial days. Paolo Maraner "Kepler's Harmonices Mundi"